Toronto Blue Jays prospects Vlad Guerrero Jr. and Bo Bichette will open the 2018 season with the Double-A New Hampshire Fisher Cats. 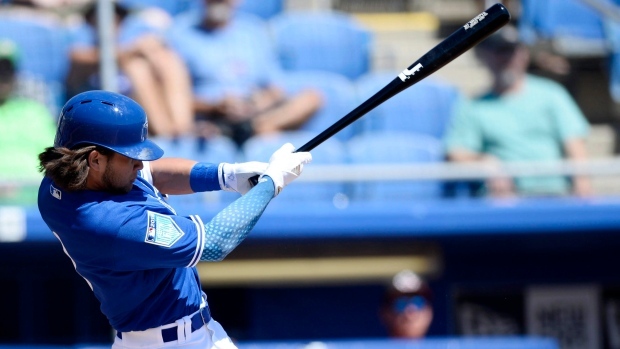 Blue Jays president Mark Shapiro confirmed to TSN’s Rick Westhead on Friday that the two prized youngsters will head to the Eastern League squad after travelling north with the Jays for their final exhibition games in Montreal next week. Guerrero, a 19-year-old third baseman, is considered one of the top prospects in all of baseball. Signed as an international free agent in July of 2015, he has six hits in nine at-bats for the Jays this spring. He split last season with Single-A Lansing Lugnuts and Advanced-A Dunedin Blue Jays, hitting .323 with 13 homers, 76 RBI and an on-base percentage of .425. Bichette, a shortstop, has three hits, one homer and four RBI in seven at-bats (a .429 average) with the Jays this spring. The 2016 second-round pick also spent last season with Lansing and Dunedin, posting a .362 batting average between the two teams with 14 home runs and 74 RBI in 110 games. The 20-year-old was ranked eighth on Baseball America's Top Prospect list in January. The Toronto Sun's Rob Longley first reported Friday about Toronto's plan to have Bichette begin the season at New Hampshire. Shapiro also said that pitching prospect Nate Pearson, who the Jays selected with the 28th pick in last year’s amateur draft, will start the season with Dunedin. Pearson pitched for the Rookie-level Gulf Coast League Blue Jays and Short Season-A Vancouver Canadians last season, finishing with a 0.90 ERA, 26 strikeouts and a 0.60 WHIP in 20 innings of work.